Phantomgate may be a game that uses 2D platforming mechanics, but the battles are completely turn-based. If you didn’t play a turn-based game before, the game’s battle system might seem quite confusing, because the tutorial missions fail to explain how the system works. 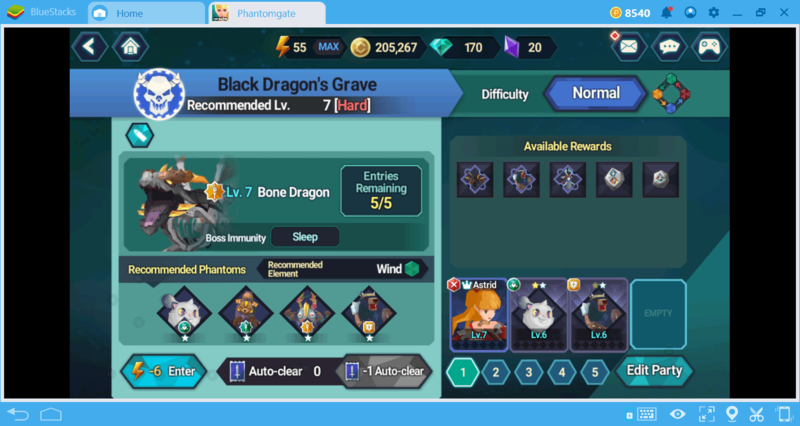 If you’re tired of losing battles in Phantomgate, we suggest you take a look at this guide: Here are all the tips on how to destroy your enemies more efficiently. 1: You can see the comments and advice of other players about this enemy by clicking here. This is a very useful feature because you get an idea of what to expect. 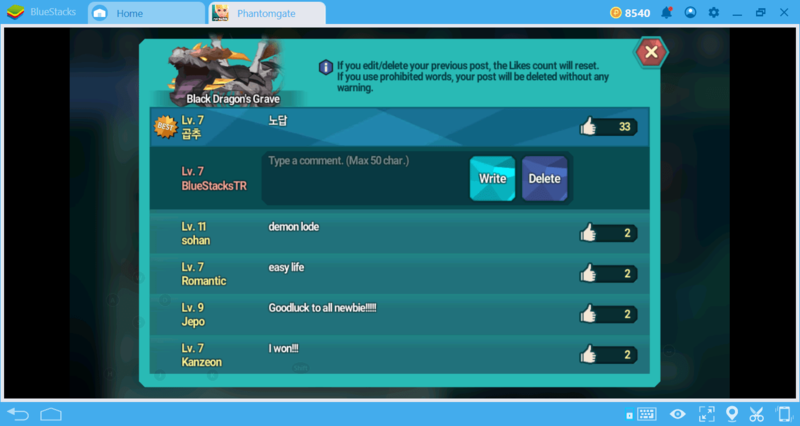 If you want, you can leave a comment as well. 2: The enemy is immune to this type of attacks. 3: This type of phantoms will be more effective against this enemy. 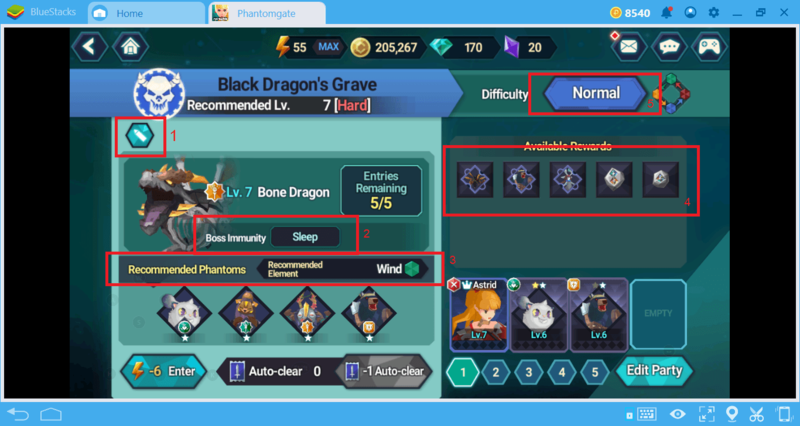 4: Here you can see the rewards you will get as a result of this encounter. 5: You can change the difficulty level here. After completing a fight at the normal level, you can try again at hard level. In this case, your rewards will increase. 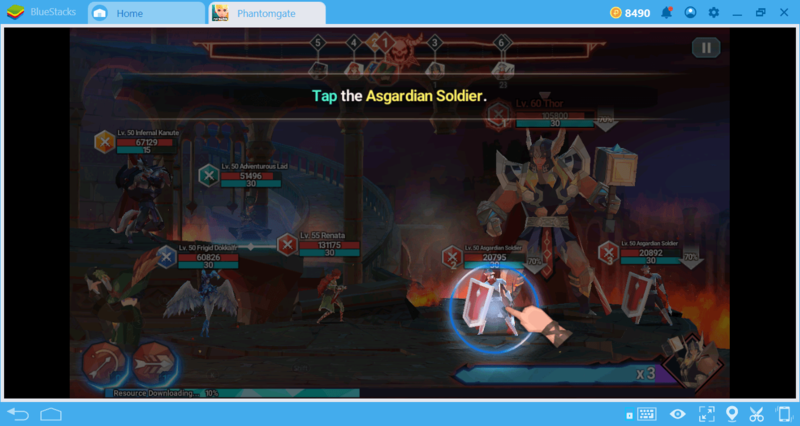 This screen is quite useful because it gives us an idea of what kind of party we should take to the battle. You can get an advantage even by choosing only phantoms with the recommended elements. The elements show the class that the phantoms belong to. There are a total of 4 element types and each phantom belongs to one of them. If you see a yellow arrow on your enemies, this means a phantom of yours belongs to an element class that can cause additional damage. So, first, find out which element your enemy is weak against, and add at least one phantom to your party with that element: This simple tip will help you win almost any battle more easily and quickly. 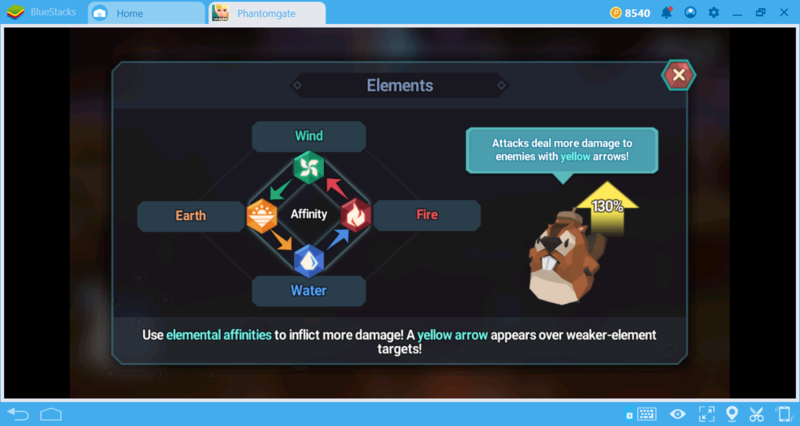 You can also win battles in which you cannot gain an elemental advantage, but remember that they will be more difficult. 1: In this section, you can see who will attack next. The numbers here are literally showing the order. Astrid’s got 1, so it’s her turn to attack. Then, the green phantom will attack. Mini-Ming is in third place, so after the green phantom, the turn will pass to him. The wolf will be the last to attack. It’s important to know how this sequence works because you should use your skills accordingly. For example, Mini-Ming is a healer but it can use its healing skills only a couple of times. Therefore, you need to calculate in advance when the queue will come to Mini-Ming, and when to use its skills. 2: If one of these symbols is glowing, you can cause more damage to one of the enemies on the battlefield. 3: Because you have a phantom with a counter element, you can inflict 130% more damage to this enemy. 4: Since you do not have a phantom with a counter element, you will inflict 70% less damage to this enemy. 5: Shows the skills that your heroes can use and how many times they can be used. These skills will be different for each hero, so you should examine them in advance. 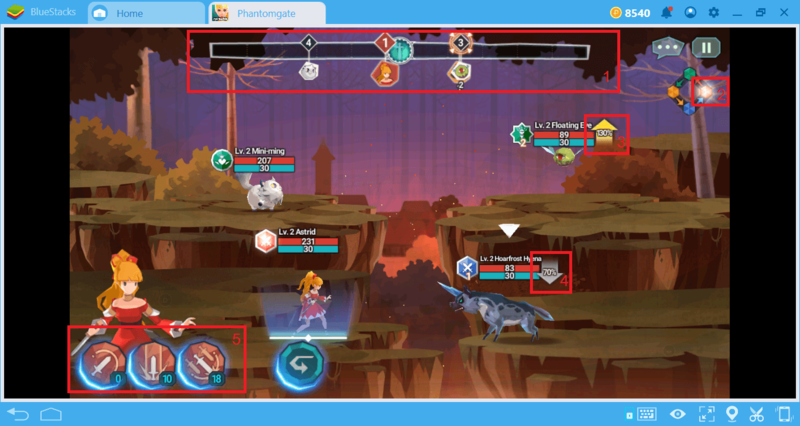 Once the battle starts, there will be a lot of things on the screen, but if you know what to look out for, you won’t have a problem. If you want, you can complete a battle automatically. However, we do not recommend that you do this. 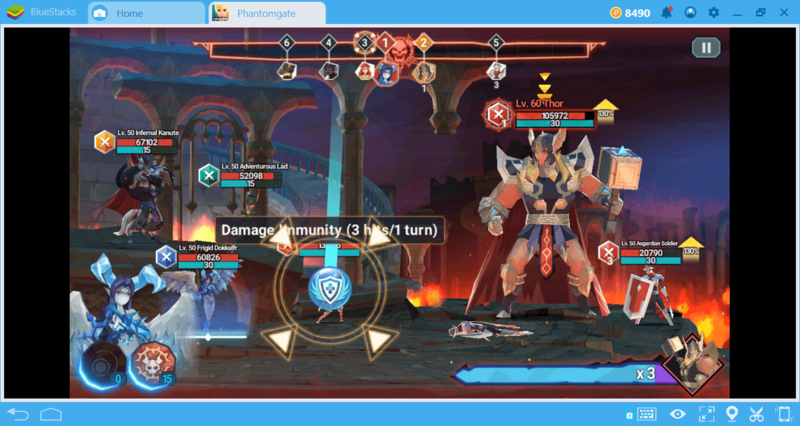 Manually controlling a battle allows you to select your targets and use your skills more efficiently. You can click on a specific target to attack it first. 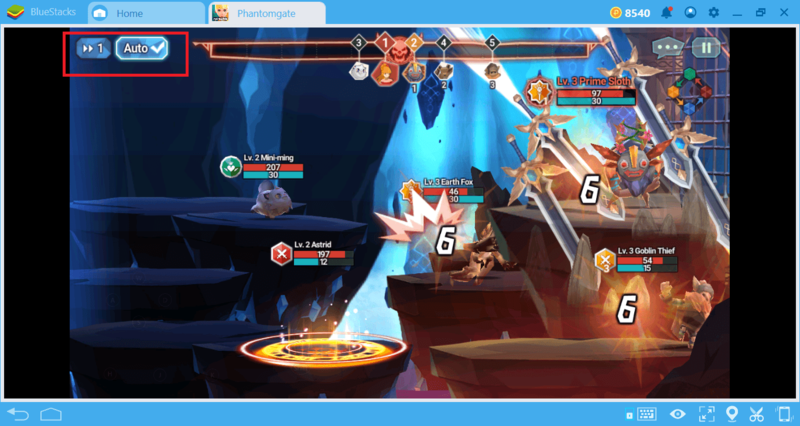 As the battle goes on, you will see some “buffs” moving around the screen. You need to hold them with your mouse and leave them on a certain character. For example, always use the damage buff on your main hero. Or, give the damage immunity buff to the tank hero. You can use your skills as you like, but if you have an enemy on the battlefield where you can do more damage, attack it first. Your enemies will attack your tank phantom first. Your other heroes are safe until this character dies. So always use your healer hero’s abilities on your tank – it’s important to keep him alive. Phantomgate parties use the standard “tank-healer-damage dealer” formation. Detailed info about how this formation works can be found in our guide for Building the Perfect Team in Phantomgate. At the moment, know that you should have at least one hero in every role in your party. Once you win a battle, you’ll win rewards that vary according to the difficulty level. 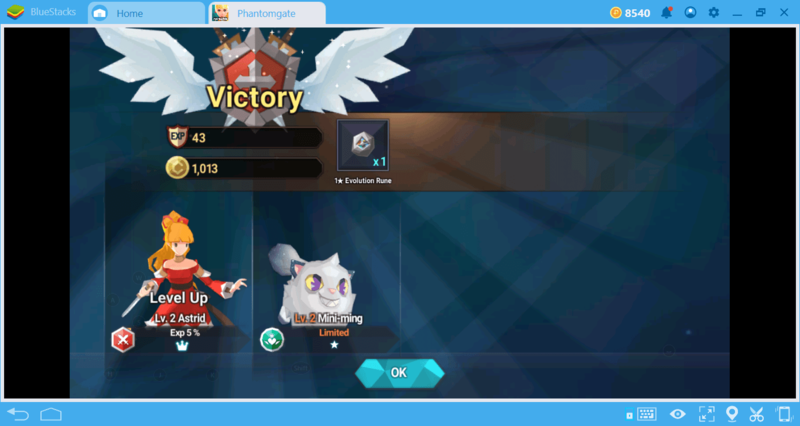 After each battle, you can earn XP points, gold, and evolution runes. These runes are used to evolve your heroes. (In our phantoms guide, we have discussed this in detail.) Challenging battles also award phantom essences. If you collect a certain amount of these essences, you can create new phantoms. 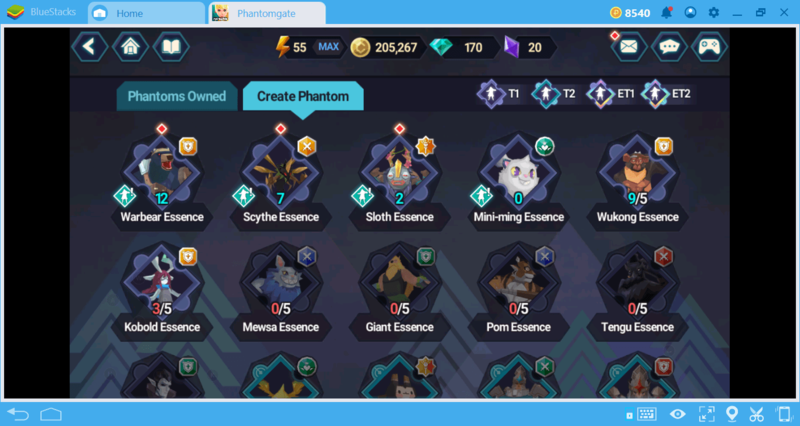 To find out how many essences a particular phantom needs, check out the phantom list. 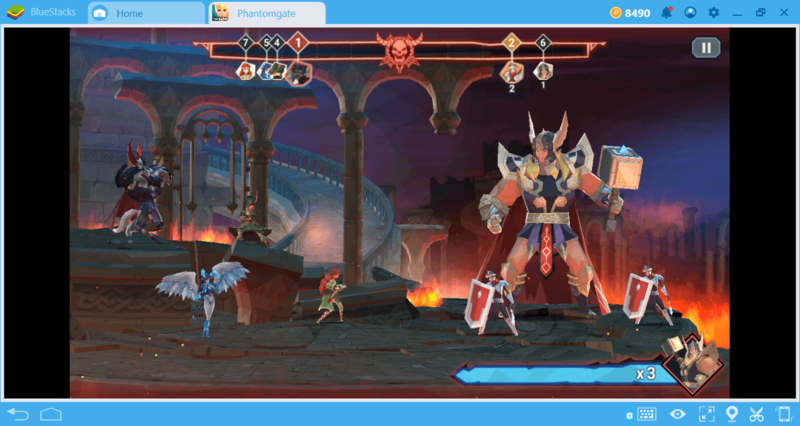 These are the most important things you need to know about the battle system of Phantomgate. Now, you can start creating chaos on the battlefield. We also recommend that you read the guides about Phantoms and Parties to find out how to create the ideal party. Good luck on the battlefield: May the power of Thor will always be with you!